Bangalore-based digital imaging firm Canvera has launched the beta version of Vivyo, a social and e-commerce platform for photographers. 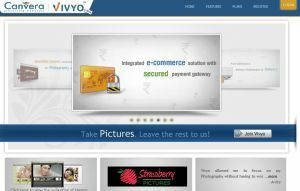 With Vivyo, they can market and sell their photos and collaborate with buyers. The platform is still in a closed Beta mode and will be commercially launched later this year. Vivyo addresses a void in the photography and imaging market for online solutions, according to Peeyush Rai, co-founder and CTO. He said, "A majority of photographers today do not have a website to showcase their work - this is changing rapidly as more and more photographers are looking for online presence, and more and more consumers are demanding online ways to consume imagery and collaborate with photographers they engage. With Vivyo, photographers will be able to achieve all this without having to worry about website design or development, hosting, or managing images and their security." Canvera also offers online hosting so photographers can create websites for their portfolios and set up microsites for their clients, where all the pictures and videos of an event or occasion will be showcased and shared. "Vivyo allowed me to focus on my photography without having to worry about order management," said Anita Mamidi, owner of Strawberry Pictures, a Vivyo user. Canvera views Vivyo as a platform for the next phase of growth for the company. Read our startup profile of the company and how it is shaking up the photography market on Techcircle.in.